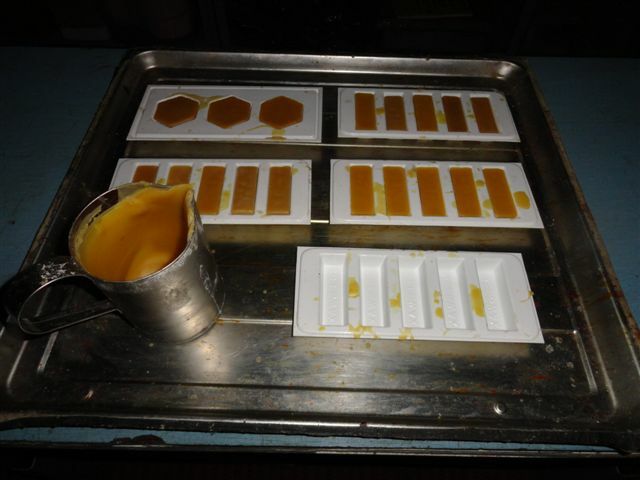 There are many ways of preparing beeswax for sale. This is the method I use. Please let us have any comments or suggestions. Warning. Hot beeswax is highly inflammable and it can burn you! Take care! 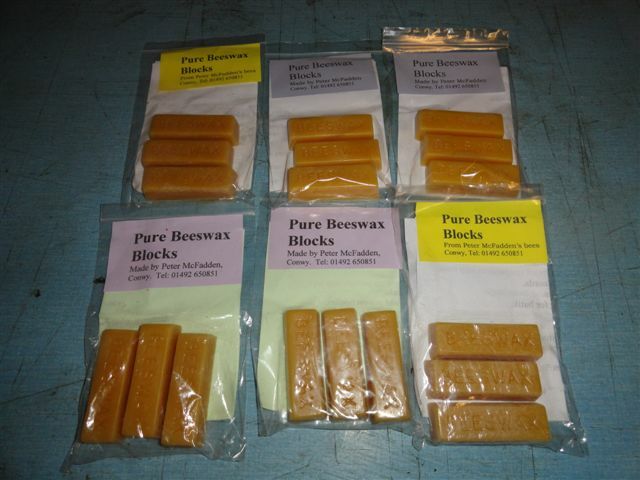 Beeswax is a valuable hive product. 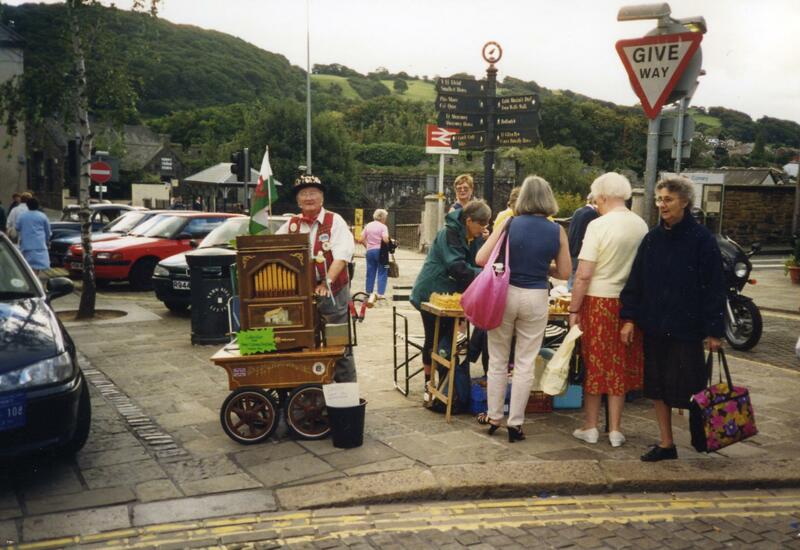 Small one-ounce blocks of beeswax sell well at the Conwy Honey Fair. 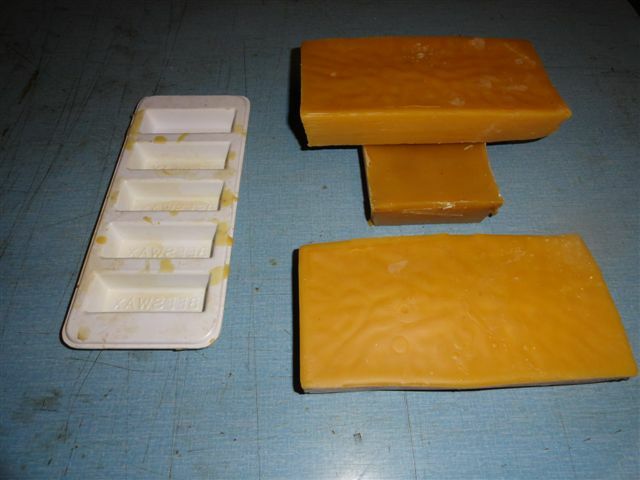 Larger blocks can be sold by weight for candlemaking. Try to save every scrap of wax when you’re working with your bees. 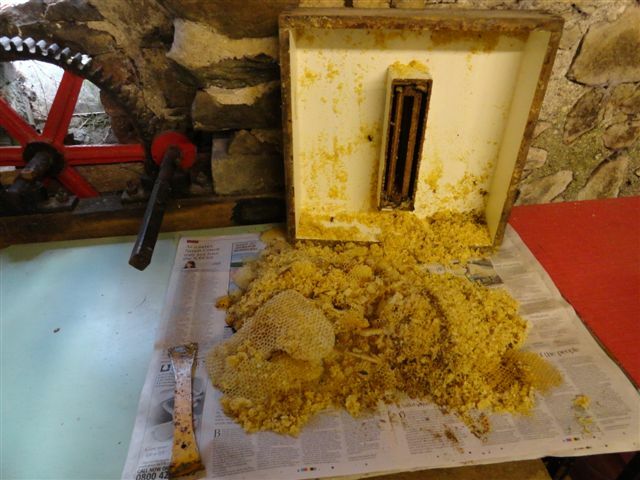 The best beeswax is produced from clean wax cappings. I don’t try to recover wax from old brood combs. I just use them as firelighters. Cappings wet with honey can be cleaned by the bees. 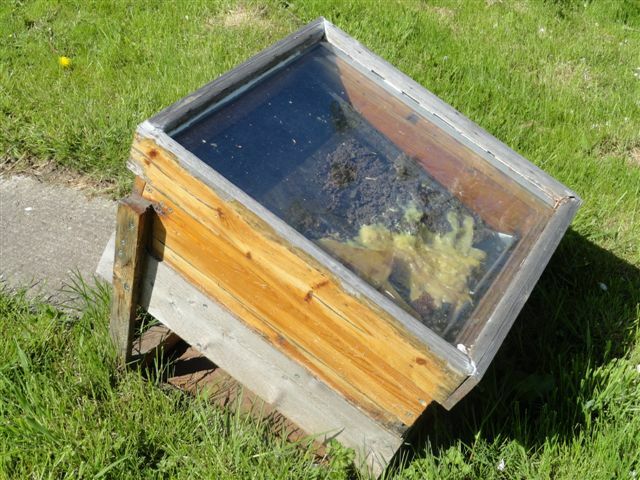 Place a tray feeder (Miller or Ashforth type) full of wet cappings on a colony of bees in the evening, when the bees are not flying, to avoid robbing. The cappings will be clean and dry within a few days. Do not leave them on the hive any longer, or the bees may try to make comb in the feeder. Clear the bees from the feeder with Porter escapes. Remove any bits of darkened brood comb. 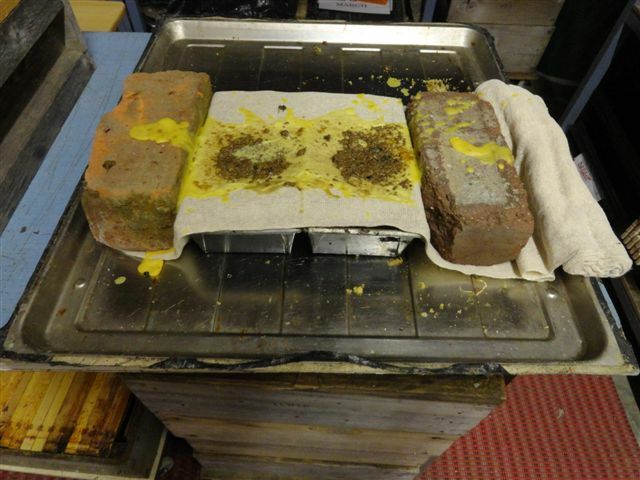 A solar wax extractor is the best way to render clean cappings into blocks, but they will only work from April to August, and cappings may not be available then. If so…. Melt the clean, dry cappings in a large old saucepan containing two inches of hot water. Do not fill the saucepan more than half full, and do not allow the water to boil. Never leave the pan unattended on the stove. Allow the wax and water to cool for a few minutes, but not long enough for the wax to start to set. The dross, known as slumgum, should have sunk to the bottom. Strain the wax and water carefully through car polishing cloth (stockinette) into two loaf tins. The stockinette can be held tight over the loaf tins by using two bricks. Allow to cool overnight. Scrape any slumgum from the underside of the blocks. Slumgum and the old straining cloths make good firelighters. I only use each piece of stockinette once. Melt the blocks in a double boiler, also known as a bain marie or porringer. 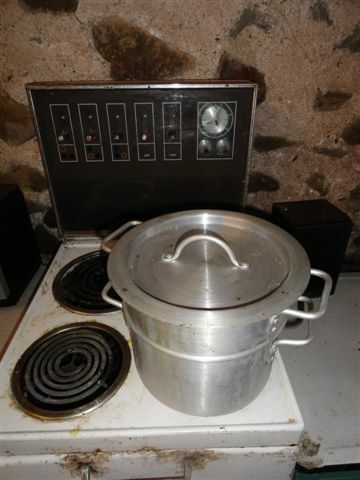 Thornes sell a useful double boiler. 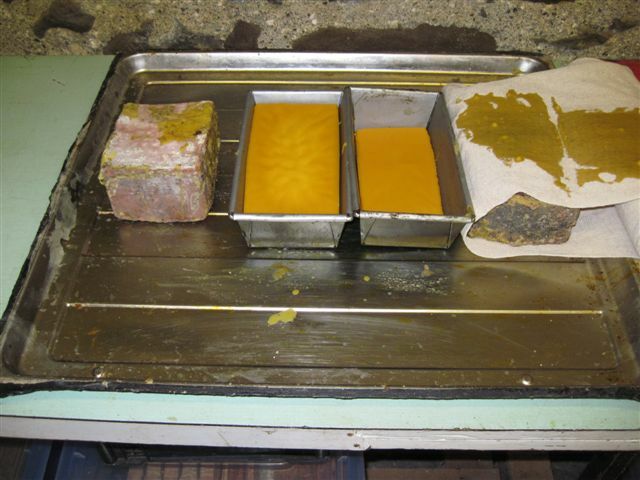 When all the wax has melted, allow it to cool until it is nearly starting to set. Any remaining debris should have sunk to the bottom. Fill a jug with molten wax and carefully fill the moulds. Do not overfill. Remove the blocks from the moulds when cool. Check the blocks, and put aside any containing bits of debris for remelting. Check that each block weighs one ounce. I pack three blocks in a griptop polythene bag, with a copy of my list of uses. I find that rectangular blocks of wax are much easier to sell than hexagonal blocks. I always ask buyers how they intend to use the wax, and I add any new uses to the list. Good advice Peter, thank you. I gave up with a solar extractor … the sun never shines when the wax is available (as you suggest). Instead I built a steam extractor a bit like Thorne’s Easi-Steam. It works extremely well and recovers a surprisingly large amount of wax from brood combs. This isn’t as high quality as cappings wax, but is certainly good enough for furniture polish and leather treatments. Rather than a bain marie, another good way to melt wax is to use a slow cooker. You can regularly find these at car boot sales or they often appear at Aldi for a tenner or so. They usually have low and high settings. If you melt grubby wax on the high setting, together with some soft water (e.g. rainwater) and then let everything cool the rubbish sinks to the bottom and can easily be scraped of the bottom of the cooled block. You should post the list of uses … it would make interesting reading. Good suggestion, I’ll keep an eye open for a slow cooker. I’m a Lidl fan myself, amazing what you can buy there. Went down almost the exact same path even to getting a bargain of a slow cooker from Aldi! Everything has worked out fine, I am just experimenting with different types of filter cloth as some types are better than others. However I am now left with lots of frames that have varying degrees of discoloration mainly due to propolis. The considered wisdom appears to be to soak them in hot Washing Soda solution which in addition has a sterilising effect. Unfortunately I am having difficulty finding a suitable boiler for the purpose at anything like a reasonable price. Has anyone any ideas they would care to share. I have read the article by David Berkkeley in the May 2013 issue of Beecraft but I have one or two reservations about the design. My own preference is just to use hot tap water, without any washing soda. Try Amazon for a low cost Swan 20 litre boiler.